Home > Pellets > Harrison's Adult Lifetime Fine 1lb. 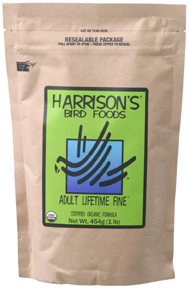 Harrison's Adult Lifetime Fine Bird Food is for small to medium parrots as well as Lories, Cockatiels, Lovebirds, Quakers, Doves, Pigeons and other small to medium pet birds. Ingredients: *Ground Yellow Corn, *Ground Hulless Barley, *Ground Soybeans, *Ground Shelled Peanuts, *Ground Shelled Sunflower Seeds, *Ground Lentils, *Ground Green Peas, *Ground Rice, *Ground Toasted Oat Groats, * Ground Sun-Dried Alfalfa, Calcium Carbonate, Psyllium, Montmorillonite Clay, Spirulina, Ground Dried Sea Kelp, Vitamin E Supplement, Sea Salt, Vitamin A Supplement, Vitamin D3 Supplement, Niacin Supplement, Vitamin B12 Supplement, Riboflavin Supplement, d-Calcium Pantothenate, Pyridoxine Hydrochloride, d-Biotin, Thiamine Mononitrate and Sodium Selenite.